Twintone - Sepia and Mushroom colourway C54. These are just mushroom. A set of 4 Poole Pottery small bowls, for dessert / fruit only 13.5cms / 5½". Factory Mark no.48 in use 1967-72. Sepia and Mushroom colourway C54. 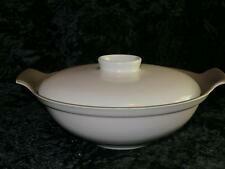 A very nice Poole Pottery open sugar bowl in the twintone pattern. Sepia and Mushroom C54 Colourway. Both pieces are backstamped "Poole England " with Dolphin logo. 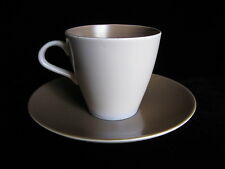 Cup and saucer. Vintage serving tureen with lid manufactured by Poole Pottery Ltd of Poole, Dorset, England, twintone colour combination number C54 Sepia and Mushroom 23.5 cm (9 1/4 inches) diameter excluding the handles, 8 cm (3 1/4 inches) deep. 1x salad buffet plate 18 cm. 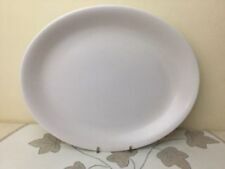 4 x salad buffet dessert plates 21 cm dia. All good condition. Only the butter dish has a tiny chip. 3x small dinner plates 23 cm dia. 1 lidded sugar pot or mustard pit ( 2 lids) 10cm high. Brazil and Sweetcorn. Teapot in Poole Twintone Pattern. Poole Twintone Mushroom Brown / Sepia. Poole Twintone Mushroom and Sepia Design. A Coffee Pot and Water Pot. Coffee and Water Pot. Has a pottery dimple spot on the water pot photoed. A LOVELY POOLE POTTERY, 12.75" CUCUMBER DISH, IN SEPIA & MUSHROOM. Size: approx. 32x10x2.5cm max. A FAB RETRO POOLE POTTERY, SEA CREST SHAPE PEPPER POT, IN SEPIA GLAZE. Size: approx. 10cm high - 5cm max. Poole Twintone Mushroom Brown / Sepia. Poole Twintone Mushroom and Sepia Design. A Gravy or Sauce Boat and Stand. Gravy Boat and Stand. Both Boat and Stand in Very Good condition. with little sign of use, crazing to stand base. Sepia and Mushroom colourway C54. Each piece is backstamped "Poole England " with Dolphin logo. Vintage gravy or sauce boat manufactured by Poole Pottery Ltd of Poole, Dorset, England, twintone colour combination number C54 Sepia and Mushroom 21 cm (8 1/4 inches) diameter from handle to spout, 8.5 cm (3 1/2 inches) wide and 7 cm (2 3/4 inches) deep. On offer is an attractive, Eggcup with an integral stand, glazed in the Twintone C54 Mushroom and Sepia colours made by Poole Pottery Dorset England. The Twintone C54 colours are Sepia, a milk chocolate brown semi matt glaze, while Mushroom is a pale biscuity pink semi matt glaze. Note if buying as a replacement that the colour varies slightly from batch to batch. The stand is 15cm in diameter, in the centre is the eggcup 5cm across 3.5cm deep it is in good condition free from damage chip or cracks, with just a few light surface marks due to use or age and a small indented area under the glaze by the rim. On the underside is the Poole Pottery Mark and the unpackaged weight is 222 grams. Sepia and Mushroom C54 Colourway. 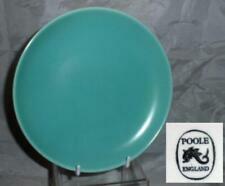 Both pieces are backstamped "Poole England C54" with Dolphin logo. Sepia and Mushroom C54 Colourway. Fully backstamped "Poole England C54" with Dolphin logo. Larger sugar bowl. Replacement china vintage cup and saucer manufactured by Poole Pottery Ltd of Poole, Dorset, England, twintone colour combination number C54 Sepia and Mushroom The cup is 8 cm (3 1/4 inches) diameter at the top and 7.5 cm (3 inches) deep The saucer is 15 cm (6 inches) diameter. A FAB RETRO POOLE POTTERY, SEA CREST SHAPE MUSTARD POT, IN SEPIA GLAZE. Size: approx. 8cm high (incl. lid) - 5cm max. 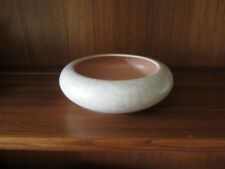 A FAB RETRO POOLE POTTERY, SEA CREST SHAPE SALT POT, IN SEPIA GLAZE. Size: approx. 7.5cm high - 5cm max. 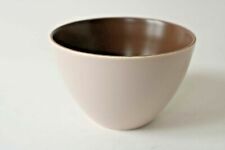 On offer is an attractive seacrest shape Egg Cup glazed in the Twintone C54 Sepia colour made by Poole Pottery Dorset England. The Twintone C54 colour is Sepia, a milk chocolate brown semi matt glaze. Note if buying as a replacement that the colour varies slightly from batch to batch. The eggcup is 5cm tall by 5cm in diameter at the rim 3.7cm across at the base and is in good condition free from chips or cracks, with just a few light surface marks due to use or age. On the underside is the Poole Pottery Mark and the unpackaged weight is 59 grams. On offer is an attractive cucumber dish decorated with the Twintone C54 Mushroom and Sepia colours made by Poole Pottery, Dorset, England. The Twintone C54 pattern; is of Sepia a milk chocolate brown satin glaze, while Mushroom, is a pale biscuity pink satin glaze found on the underside of edible mushrooms. Produced from approximately 1953 to 1968. Note if buying as a replacement that the colours vary slightly from batch to batch. The dish is, 32cm long by 10cm wide by 2.5cm deep, it is in good condition free from damage chip or cracks, with just the odd light surface mark commensurate with use or age. On the underside is the Poole Pottery dolphin Mark and the unpackaged weight is 344 grams. On offer is an attractive contour shape hot milk or water Jug decorated with the Twintone C54 Mushroom and Sepia colours made by Poole Pottery Dorset England. The Twintone C54 colours are Sepia named after squid ink and is a milk chocolate brown semi matt glaze, while Mushroom a semi matt glaze, is a pale biscuity pink found on the underside of edible mushrooms. Note if buying as a replacement that the colour varies slightly from batch to batch. The jug is 7.5cm in diameter at the rim 10cm at the base, by 16.5cm deep excluding lid, which has the cut out for closing off the flow and is in good condition free from damage chip or cracks, with just a few light surface marks commensurate with use or age. On the underside is the Poole Pottery Mark and the unpackaged weight is 400 grams. On offer is an attractive large cucumber Dish decorated with the Twintone C54 Mushroom and Sepia colour made by Poole Pottery, Dorset, England. The Twintone C54 pattern; is of Sepia a milk chocolate brown satin glaze, while Mushroom, is a pale biscuity pink satin glaze found on the underside of edible mushrooms. Produced from approximately 1953 to 1968. Note if buying as a replacement that the colours varied slightly over the years of production. The dish is, 41.5cm long by 13cm wide by 3.2cm deep, it is in good condition free from damage chip or cracks, with just the odd light surface mark commensurate with use or age. On the underside is the Poole Pottery dolphin Mark and the unpackaged weight is 689 grams. On offer is a distinctive vintage lug handled soup bowl with stand decorated with the Twintone C54 Mushroom & Sepia colours made by Poole Pottery Dorset England. Although originally sold as soup bowls, we know that many people now use these interestingly designed bowls for desserts, cereals etc. The Twintone C54 pattern is of Sepia named after squid ‘ink’ is a milk chocolate brown, while Mushroom, is the pale biscuity pink found on the underside of edible mushrooms. The bowl is 15cm (6”) in diameter by 4.5cm (1¾”) deep, the stand is 17.5cm across and has a small indentation in the centre matching the soup bowl base. They are in good condition free from damage chips or cracks, just the odd light surface mark commensurate with use and age. On the underside are the Poole printed marks the unpackaged weight is 496 grams. 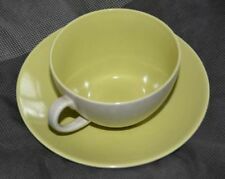 On offer are an attractive, streamline shape Tea Cup and Saucer glazed in the Twintone C54 Mushroom and Sepia colours, made by Poole Pottery, Dorset, England. 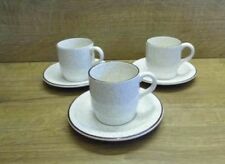 The Twintone C54 colours are Mushroom a pale light brown almost pink semi matt glaze used on the outside of the cup and Sepia a darker brown semi matt glaze used on the inside, the saucer is Sepia with a white underside. Note if buying as a replacement that shading differences did occur within the range over the years of production. The cup is 9cm in diameter at the rim tapering down to 4cm at the base by 6cm tall, the saucer is 14.5cm across and they are in good condition free from crazing, chips or cracks just a few light surface marks due to age and use. On their undersides are the Poole Pottery dolphin marks and the combined unpackaged weight is 271 grams.